Are you worried about the Dollar? Discover ways to leverage volatility, inter-market correlations, and overall bias to help you make smarter decisions. The top-ranked NBA player likely won’t remain at the top of the basketball world forever. At some point, age will take over and his dominance on the court will become legend. But until then, he’ll keep fighting to maintain his top-ranking status. There’s a corollary here to the U.S. dollar, which has been the world’s dominant reserve currency since 1921. After 96 years on top, some analysts think it’s getting up there in age. And may need to be benched. No currency has maintained its reserve status forever. The record is 110 years, which was held by Spain (1530–1640). On the other hand, what’s to say the dollar can’t break that? The future is naturally a rumor, and no one can offer predictions with any certainty. But the dollar’s potential decline is a great story for the press. You’ll routinely hear all kinds of speculation about the reason for the dollar’s decline—from geopolitical tensions, to nations moving to settle trades in native currencies, to other currencies growing stronger. These ideas will keep non-traders wringing their hands for a while. But your trader status means you don’t just focus on the news. As a matter of course, you work to understand the relationship between the dollar and other markets. This helps you gauge when the dollar’s in trouble, which markets might be affected, and how that impacts what you trade. You’re likely not going to wake up one morning to find the dollar has been replaced. If that were to happen, it would be a gradual process. And its successor will become clear slowly—whether it’s one currency, a basket of currencies, or a basket of commodities. Hypothetically, what if the markets were to move away from a dollar-denominated world? How would this affect the price of international commodities like gold, oil, or the softs, where the dollar is the standard unit of currency? What if Russia were to make the ruble a dominant currency? How would that shape trades for natural gas? Here’s the thing: if countries start to “de-peg” from the dollar (not have their currency’s exchange rate tied to the U.S. dollar), it could certainly impact the value of the dollar as a reserve currency. But nobody knows how much that value is. And the de-peg may or may not put pressure on the dollar’s price relative to other currencies. Volatility (“vol”) comes and goes constantly. If you think the dollar is making subtle moves that suggest it might lose its reserve status, consider adding commodity futures correlated to the dollar—gold, oil, or softs—as the price of these products will be impacted. But keep in mind that pricing in U.S. dollars is merely a receipt for a transaction. For example, oil has the same value all over the world, but in each nation, it’s priced in its local currency. Even if changes in the dollar impact the margins of local producers or consumers, the “real” value of oil doesn’t change. If the dollar becomes weaker, a particular commodity’s price could move lower or higher in local markets. But this can’t be predicted, and it doesn’t matter where oil is priced. What matters is there's liquidity and it can be traded. If the dollar gets “fired,” vol for commodities will likely increase. And there are different ways to measure vol. For instance, you could add the ImpVolatility study to the /CL chart. Another vol measure for crude is the OVX—the CBOE Crude Oil ETF Volatility Index. Based on past news events, take a look at how these indicators moved up and down within a range. If vol spikes without a correspondingly large news event, and stays high, something else could be brewing. Vol telegraphs market uncertainty, and that’s when traders pay attention to risk. But there’s often more to it than a vol spike. Futures contracts trade on a curve. And the shape of that curve could help “shape” your trades. Because futures are contracts for a future delivery date—one month out, six months out, one year out—the shape of the curve can reflect the market’s overall bias. Futures contracts trade at different prices for different months. And that price is based on speculation. As an example, if you look at crude’s futures curve, the curve is determined by things like supply and demand (inventory levels), storage costs, and interest rates. 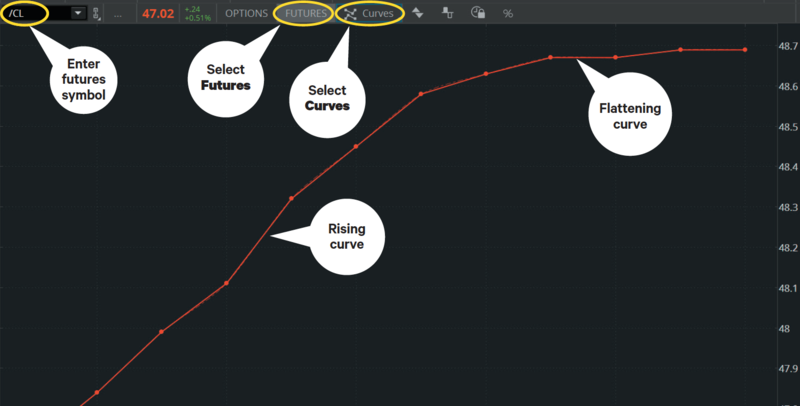 The futures curve is available on your thinkorswim® platform from TD Ameritrade. Click on the Charts tab, then Product Depth. Enter the futures symbol in the symbol box, click “Futures,” then “Curves.” To make things look less busy, you could filter out some of the futures series. Because the curves are based on speculation, the further out you look, the less certainty. And that means higher prices in the longer term, which is what is going on in the futures curve of /CL in Figure 1. It slopes upward. When the shorter-term outlook is more uncertain than the longer term, the futures curve begins to slope down. FIGURE 1: CHECK THE CURVE. The spread between the spot and future price in crude oil is rising faster in the nearer months. Notice how the curve flattens as contracts move farther out in time. Source: thinkorswim® from TD Ameritrade. For illustrative purposes only. The shape of the curve is not about the direction of price movement. It has more to do with the rate at which demand is growing faster than supply, or supply is growing faster than demand. When the spread between the spot and future’s price is rising, oil prices typically increase. And when the spot/future spread starts narrowing, prices typically decrease. Keep in mind that a price curve’s shape can move dramatically based on the underlying’s price. And nearby months tend to be more responsive to the market’s supply and demand than futures prices further out. Besides supply and demand, changes in inventory reports, geopolitics, and fundamentals can stir up vol in various futures markets. So, if vol goes higher and the futures curve gets steeper, it can mean a lot of market uncertainty. You can sometimes leverage this type of information in a trade. Your goal is not to speculate on the direction of oil prices. Instead, by looking at vol and the futures curve, you can start to analyze futures by analyzing the relationships between contracts. You may want to consider trading calendar spreads, which is an alternative strategy to purchasing the long future. Futures calendar spreads are different than options calendar spreads in that they speculate on the relationship between the near-term and longer-term futures contracts. On the thinkorswim platform, you can chart the futures spreads (Figure 2). FIGURE 2: ANALYZING CALENDAR SPREADS. In just four steps you can go from stock symbol to trading a calendar spread. Source: thinkorswim® from TD Ameritrade. For illustrative purposes only. 1—From the Trade page, type in the futures symbol. 2—Select “Futures,” and choose to list all contracts. 3—Select “Calendar” from the spread choices. 4—Expand the contract you’re interested in, right-click on the spread you’re considering, select the “More Info” option, and then Charts (see Figure 3). 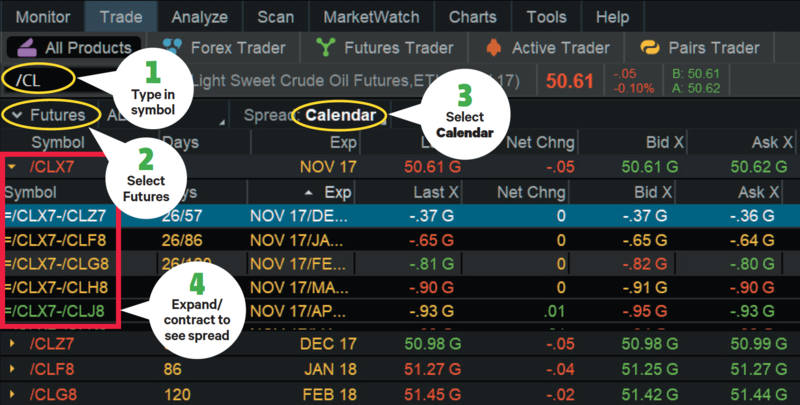 FIGURE 3: TRADING CALENDAR SPREADS IN FUTURES. Charting the spreads allows you to see if the spread between two contracts is increasing or decreasing. Would you buy the shorter-term contract and sell the longer-term one, or vice versa? Source: thinkorswim® from TD Ameritrade. For illustrative purposes only. Spreads are charted by subtracting the farther-out month’s price from the closer month’s price. And if those spreads continue to widen with increased vol, it may be time to pay close attention. Would you sell the longer-term contract and buy the nearer-term one? Separate from the fate of the dollar, consider a similar analytic approach when factoring in potential changes and market turbulence. 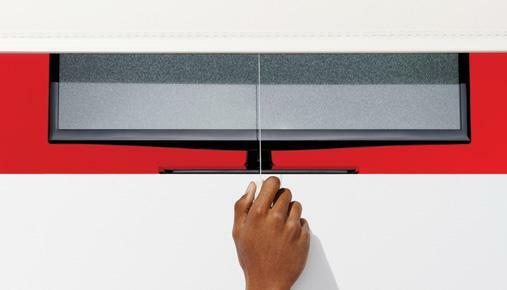 Don’t get hung up on headlines. Instead, look at those news ripples, refine that information, and figure out how to use it to create a trade. Determine which futures will be impacted, then review their vol, the futures curve, and spreads between contracts to make a more informed decision. *Futures and futures option trading is speculative and is not suitable for all investors. Please read the Risk Disclosure for Futures and Options prior to trading futures products. Futures accounts are not protected by the Securities Investor Protection Corporation (SIPC). Futures and futures options trading services provided by TD Ameritrade Futures; Forex LLC. Trading privileges subject to review and approval. Not all clients will qualify. 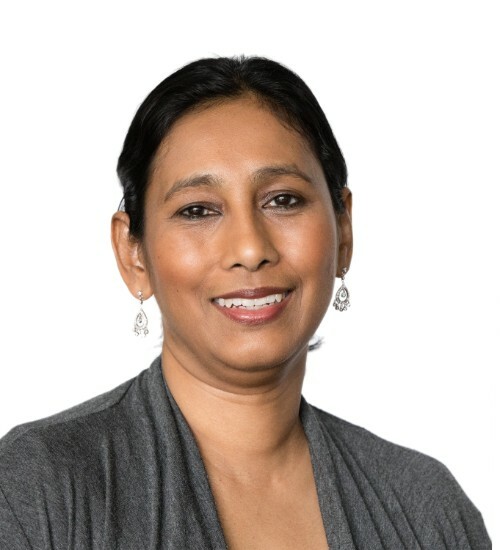 Spreads and other multiple-leg strategies can entail substantial transaction costs, including multiple commissions, which may impact any potential return.